Joyce Carol Thomas was asked in an interview with The Brown Bookshelf, "What was it that made you decide to begin writing for children?" Her response was, "When my children were born, I noticed that they watched me reading books. Then, they would pick up a book and pretend to read it. Children, I think, soak up everything their parents do and say." My experience tells me that she is right. Joyce Carol Thomas has published more than 30 books. Many of them have received Coretta Scott King award recognition including The Blacker the Berry and I Have Heard of a Land. In addition to writing, she has spent time as a motivational speaker, teacher, playwright, and professor (joycecarolthomas.com). In an interview with HarperCollins she said, "I hope that my stories and poems create a bracing and embracing sense of joy in children. Word by word, song by song. Young children need to believe in the special beauty that already exists in them." This week we read two picture books by Joyce Carol Thomas that are collections of poetry, Gingerbread Days and Brown Honey in Broomwheat Tea. Publishers Weekly reviewed Brown Honey in Broomwheat Tea and stated, "Joyce Carol Thomas celebrates the beauty and heritage of African Americans in a lyrical collection of poems. Couched in language that is learned yet emotional, the verses focus on family life, love, freedom and dreams." Many the poems in the book mention honey and bees. 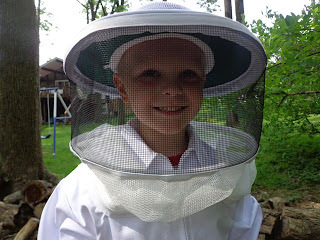 I remembered while reading the poem, Honey, that my son asked many weeks ago if he could get his own bee suit, so that he could help me work with our bees. 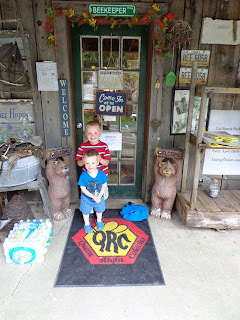 I thought a perfect way to celebrate Joyce Carol Thomas' birthday we be to take a trip with three of my children to a special little place to fulfill my oldest son's dream of becoming a beekeeper. 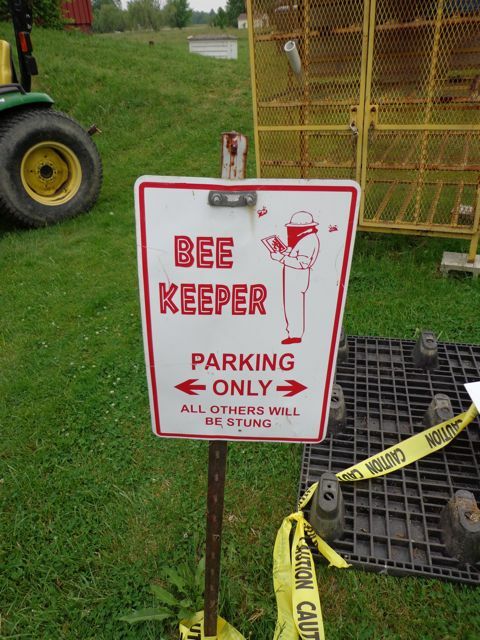 This sign greeted us at Queen Right Colonies in Spencer, Ohio. My son could not wait to try on the bee suit despite a bout with conjunctivitis. 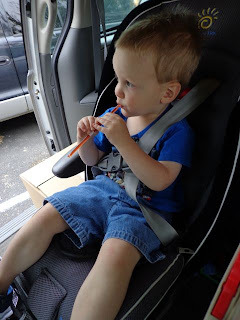 My boys enjoyed Honey Sticks while I fed the baby before we headed home. Before we left I noticed a gentleman in this barn making bee boxes. I asked him how many he makes in a week. He said, "It depends on the time of year. But, generally 75-150 boxes a week." Wow! They also specialize in paraffin wax dipping for wood products. Who knew there was such a thing? Notice the giant vat to the left. He warned me not to get too close! 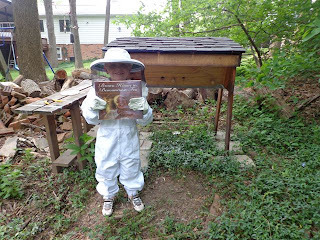 My little beekeeper with our Kenya Top-Bar Hive (Click here to see how we built the hive.) and Joyce Carol Thomas' Brown Honey in Broomwheat Tea. He got to inspect one of the bars. 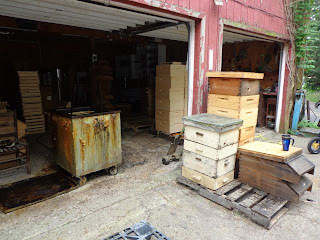 The bees began this bar less than two weeks ago. Upon careful inspection this comb has honey and developing bee larvae (darker cells). 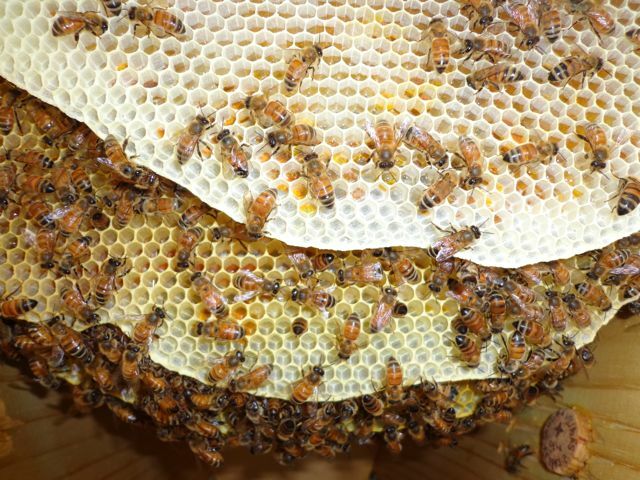 A look inside the hive. 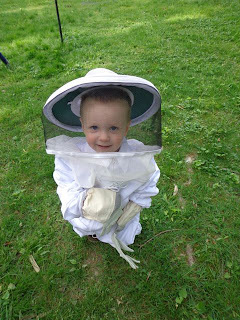 My little one insisted on trying on the bee suit too! My oldest son has put up with his older sister picking on him for a long time. My wife and I said quite often, "One of these days he is going to haul off and get her back and we will have to pretend we didn't see it." That day has come and gone and he is making up for lost time. He now knows how to push his sister's buttons. This week he used Joyce Carol Thomas' book, The Three Witches, with illustrations by Faith Ringgold, to scare her out of his room when we were reading books before bedtime. The book has a "creepy" cover, story, and illustrations but he and I loved it. My daughter, well...not so much! I am thinking that it will be too small, but we could give it a try! Wonderful post, Eric! Joyce's books sound just fabulous, and I loved getting a peek at your beekeeping adventure - so interesting! Thanks Susanna! The bee adventure has been so much fun that we can't help but share! Who knew they made beekeeper suits that small? Thanks so much for introducing me to a new author this week! I didn't either. It was a perfect fit too! Joyce Carol Thomas was new for us also. My daughter enjoyed her books of poetry and my son loved The Three Witches! Enjoyed your post! Love seeing the boys in the suit!!! I think it's wonderful that Mason will be able to help with the beekeeping! Thanks Gail! 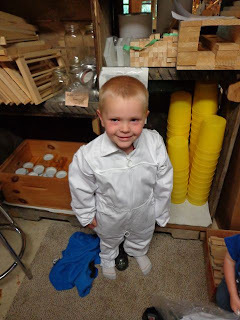 He was very excited to get the bee suit. He said the next day, "I think we to check on the bees again!" Thanks Renee! I am a believer that there is always a way to connect a book to an experience. 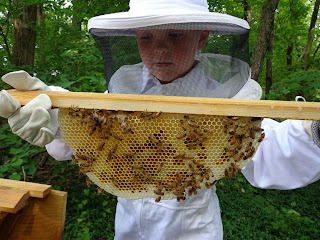 LOVE the beekeeping family adventure update and I am SO for letting kids resolve their own issues where possible and appropriate, yay for your son' leaning how to sue the Three Witches to his advantage!! He was quite pleased with his ability to "freak" out his sister! Thanks for stopping by Joanna! March 20 - Bill Martin Jr.
Blog written by Eric VanRaepenbusch. Powered by Blogger.